Django’s dazzling virtuosity makes approaching the Gypsy Jazz style a daunting proposition for beginning or intermediate students of lead guitar. However, unlike more complicated harmonic jazz forms, many popular Gypsy Jazz numbers involve pretty straight-forward, traditional chord changes. From a lead perspective, many of the phrases and melodic elements are built off of simple arpeggios and popular chord shapes. So when you slow the music down, and take a look under the hood at what’s happening, you can walk away with some valuable new ideas to inspire your lead approach. 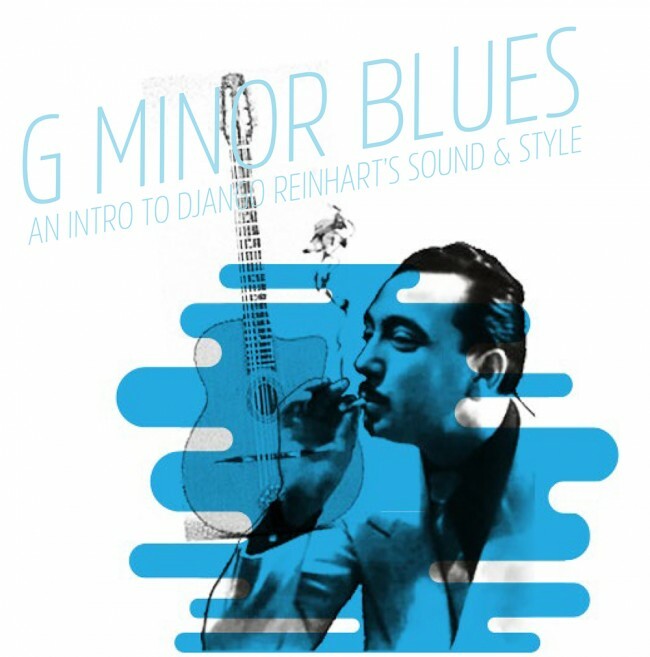 This 3 chorus exercise was inspired by the song Minor Blues by Django Reinhardt. Minor Blues is a great doorway into this style because it’s based off of a simple i-iv-V (Gm6, Cm6, D7) structure. The lead lines in this exercise play off of minor 6th arpeggios with an added 9th for the I and iv chords, and a D7b9 arpeggio for the V chord. We’re using the D7b9 (as opposed to a normal D7) because it’s characteristic of the style, and creates the appropriate tension to resolve back to the minor I chord. Before beginning the exercise, I would recommend skipping to the end of the tablature and practicing the 3 arpeggios provided. It may take a second to get your fingerings together so that you can play them fluidly, but it’s important to get these under your fingers first. Django has influenced iconic guitarists from Les Paul to B.B. King to Carlos Santana, and it’s my sincere hope that this exercise will open the door to new melodic ideas, fingerings and possibilities for your lead playing. I’ve been going through your ‘Lone Wolf Blues’ course on Truefire. I’m a long time Blues player but never got into fingerstyle until now. Your course has been a great help in getting me into it. I’m already writing a ragtime song that is uses your ‘A Rag’ as it’s beginning. Hearing you play Django style makes me think you should do a Truefire course on him. Anyway just wanted to give a shout and thank you for making fingerstyle comprehensible for a nooby. Take care.